St. Elmo's Fire - "Artifacts Of Passion"
St. Elmo's Fire were a Cleveland, Ohio based band that existed for barely a year and a half from 1979-1981. The band released one album, "Live At The Cleveland Agora", and in 1998 band member Paul Kollar reissued that LP on CD with bonus tracks (see AI #5). Kollar has worked hard in recent years to assemble the band to record a new CD and has succeeded despite everyone being geographically dispersed. Four of the original quintet are present including Erich Feldman on acoustic & electric guitars and effects, Mark Helm on drums, Paul Kollar on bass guitar & bass pedals, cittern, 6 & 12 string guitars, mellotron, organ, and percussion, and Elliot Weintraub on acoustic & electric guitars, shofar, and effects. Fifth member Stephan John Stavnicky isn't listing as a player but is listed in the songwriting credits on two tracks. Also part of the lineup are newcomers Miner Gleason on violin and Philip Wylie on tabla, djembe, and a host of other percussion, plus numerous guests. There's quite a bit of stylistic diversity on Artifacts Of Passion, some of which ranks among the best progressive rock I've heard this year. The set opens with an extended intro piece called "The Dead Sea Scrolls". The band kicks in with strumming acoustic guitar, a very cool jamming bassline, a simple but GORGEOUS mellotron melody that leads the way, and I also hear barely audible intermittent bubbly synth embellishments. The music has a symphonic flavor but the Eastern influences inject a psychedelic air to the proceedings. Call-to-prayer chanting colors the atmosphere making this an opener that grabbed and held my attention. "North-West Territory" is next, but a bit of a letdown being a basic prog rock instrumental with catchy melodies from the guitar and violin. It reminds me a bit of something off of David Ragsdale's solo CD. The music is well done but didn't excite me like the more adventurous stuff these guys are capable of. 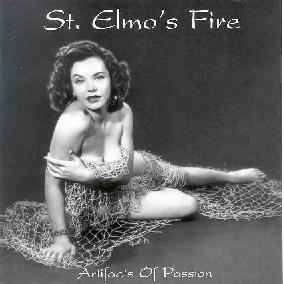 But I needn't have worried because St. Elmo rekindles the fires on the next track, "Contortions Of The Balrog". I love the intro with the high-pitched Frippoid licks that sail from left to right channel and back again. The second guitar and bass play patterns that slowly build a tension, and indeed the band soon launch into a King Crimson styled heavy rocker. I had to fasten my seatbelts because the band was continually shifting the pace, kicking out thudding metallic chords, then making 90 degree turns-on-a-dime with guitars, bass, and drums all dueling madly and keeping the intensity level HIGH! There are embellishments throughout that I couldn't even begin to describe. But just as the garnishment on the plate makes the meal so much better, so do all the extra instrumental details color the music here. An excellent track. "Esmerelda" takes a completely different turn, being a trip down to the market in Istanbul or some such place. Eastern strings and percussion play at a fiery pace and I could just imagine a group of belly dancers frolicking like wild dervishes. "The Nemo Syndrome" includes similar patterns as those heard on Contortions, but is still a completely different song. The band alternates between quieter passages in which the main song verses are sung, and blazing intricately structured and heavy rocking jams. And just when I'm recovering from that, "Erin & The Green Man" once again veers into left field, sounding like an Irish pub tune. But for "The Abduction Of The Adolescents" the Elmos draw once again on their King Crimson influences, the early part of the track sounding much like that bands Discipline-era. The musicians blaze through complicated, high octane structures that will make fans of heavy instrumental progressive rock drool. But soon the pace eases and we find ourselves back in early 70's Crimson territory, though some of the guitar parts are decidedly un-Crimson, giving the music more of an identity that St. Elmos Fire can claim as their own. Ten minutes of intense progressive rock and another very strong track. "Lake Effect" is a majestic symphonic track, embellished very nicely by a bagpipe melody. And "Dog-Eared Page" is the closing track, a good fun tune in which banjo and mellotron coexist comfortably to create a bouncy blend of Cajun music and progressive rock. Definitely something different. In summary, Artifacts Of Passion could be criticized for being a bit uneven, bouncing between styles that are too radically different to be coherent as a whole. But when these guys get cooking... they're a true mind-blower. Too bad they're so far from one another as I could easily see them making a serious buzz on the prog festival circuit. So if you liked the first St. Elmos Fire release, then you should run quickly to check out this one. For more information you can visit the Sprawling Productions web site at: http://www.sprawlingproductions.com. Contact via snail mail c/o Sprawling Productions; PO Box 1398; Burlington, IA 52601.